I'm famous for not liking elevators, but using them often because I'm simply too lazy to walk the four flights of stairs to my cubicle. But the thing I hate most about elevators is being in an enclosed space with strangers packed into a steel box like a sardine. I get very claustrophobic, begin to sweat and sometimes have felt like I was going to pass out. Another reason elevators stress me out is the potential of inappropriate small talk. I cannot make small talk other than commenting on the weather or a simple "Good Morning" and then looking down at the floor. Once I noticed there was a button in our corporate elevator that said "P" and I actually said to an executive, "Oh, is that the mechanical penthouse?" No idea what that was supposed to mean. So if you want to use the elevator and need to avoid small talk and large crowds, why not try this commonly known hack of pressing the floor you want to get to and the close button at the same time to immediate jet up to your desired location? 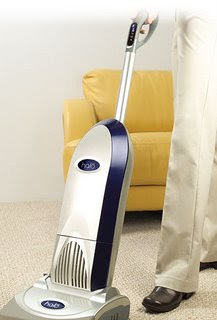 The Halo UVX Ultraviolet Vacuum cleaner boasts the ability to vaporize the DNA structure of all those nasty mico-organisms nesting in my carpeting with the press of a single button. The button activates a UV-C bulb that will desimate dust mites, viruses, bacteria, fleas, lice and mold in my carpet and flooring. It's a pretty cool concept, but I'm not that wigged out (yet) about things that I can't see in my carpet. But since it's an expensive vacuum-retailing for $399-it qualified as a wastrel purchase and I certainly wouldn't turn one away were it to be given to me as a gift to improve my household cleanliness.